April 20th week available. Luxury villa. Great reviews, Premier status. 4 bed, 3 bath, Wifi, private pool, beautiful community. Superb Location. So go ahead and BOOK WITH CONFIDENCE. If you are not sure carry on reading for more details. If you are looking for a fabulous place to stay where you can book with confidence knowing you have a great price with caring and attentive owners….then your search is over! Our location is perfect if you are looking for a quiet place that’s a short drive from the theme parks, shops and restaurants. The community in our opinion is one of the prettiest locations in the area, with several large lakes and ponds. The villa provides all the conveniences of a modern home, including Wifi internet access, Cable TVs, a full kitchen, AC, Dishwasher, microwave, cooker, washing machine and dryer. All of this in conjunction with the south facing pool makes our villa an ideal place to unwind after a fun-filled day at the theme parks. We also have a local managing agent who you can also call upon to help if you have any issues. We get asked about our pool. Its South facing and gets the sun during the whole year, and can be heated (at extra cost, sorry). Normally its not required to be heated from April to October. We have many regular visitors to the villa which is a testament to the villa and our service. Bridgewater Crossing is about the perfect location, being a very beautiful and quiet community yet only a few minutes drive to parks, shops restaurants and all the adventure you want. You can see that our listing has been on the vacation rentals site since 2002 so you can trust us to provide a great product and matching service. The home will be a comfortable base you will have everything you need. Our local managing agents will be available if you have any issues and we are only an email away. We also provide wifi, and Netflix built into our TV. With us you will get a professional and fair service, with amazing accommodation in a fantastic location. We have a local management company who can take care of you. Really everything you need is there including,pots pans, dishes, knives, forks, mugs, glasses, corkscrew, coffee maker, toaster, blender, microwave, full oven. Dining is in the family area and is for 6 to 8 people. Your luxury vacation villa is well equipped and furnished to a high standard. As you would expect the villa is tastefully decorated and fully air conditioned. Cable television, Netflix, Wifi, Xbox are available. The kitchen is fitted out with all the equipment you would expect to need during your Florida vacation. This includes a full size oven and hob, a microwave oven, a large fridge / freezer with icemaker, dishwasher, waste disposal, coffee maker, toaster, blender and a full set of cutlery, crockery, utensils and house wares. The villa has a telephone system. Local calls are free, long distance and international calls can be made via a telephone calling card widely available throughout the area. The price includes all gas, electricity, linen, towels etc. Even those small items that are occasionally required are provided such as vacuum cleaner, iron and ironing board, hairdryer etc. We have many happy guests who have stayed with us from all around the world. We would be happy to provide you with references if you require them. We know how precious family holidays are and will do our best to make sure your Florida holiday gives you great memories that will last a lifetime. minor problems, one being us not able to figure out using the TV and one day with the pool heat. Both were taken care of with quick responses from the management team. Great job to all. House was well maintained and clean inside and out.The kitchen had more than enough items to do any task you wanted to do. the street. Neighbors were quiet and friendly. 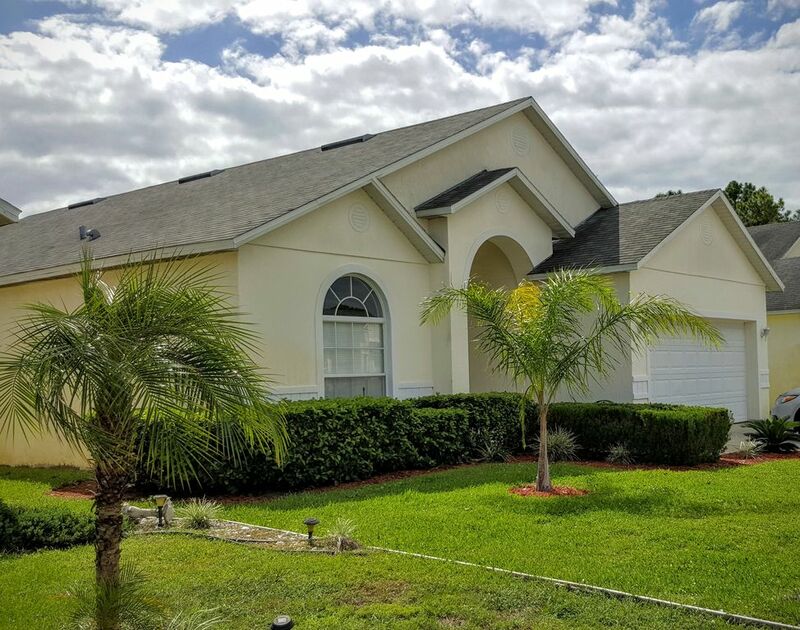 It is close to many places to eat, a grocery store, and easy access to main roads to get Disney or other places of interest. We have been snow birds for six years, each in a different house. We liked this property so much that we already booked it again for next year. We had a great stay at short notice, so many thanks for accomodating us. I promised I would do you a review so here you are. We thought the location was perfect. It was easy to get to the parks (sometimes the I4 does get busy though) and also to the beach (st pete's beach). The weather got a bit cool so we were glad we had booked the pool heating. There were 5 of us so we had enough space inside the house and had 2 rest days when we stayed at home and relaxed. We watched netflix and played in the pool on those days. We cooked a big pasta dish with garlic bread in the evening that night. In summary I would recommend this villa and we would like to come back again soon. many thanks for the kind feedback. We do try and fix everything quickly. We only found out about the lock when you left and it was fixed straightway. The pool light is also fixed, but often it stays on for hours and the bulb does blow quite regularly. There are several other patio lights which can also light up the pool. We do take pride in fixing things quickly. We had only been in the house doing maintenance in mid November. Also the management company had been and checked all was ok early without waking our guests, as indeed it was. Sorry for delay in posting. We had a great stay at the house. We used it as a base for the park trips. Weather was warmer than we had expected which was a bonus. We had a problem with the fan which was fixed same day. So thanks to sophie and the team for making our stay so comfortable. We had a perfect holiday which we didnt want to end. Sometimes we have the odd problem in the house and get the team to fix it . You did the right thing and called our local agents first thing and they came and fixed the fan by the time you got back from lunch! Great stay at this house. House was clean and perfect for what we needed. We found the accommodation to be convenient for the many things we did during our stay such as Disney and St petes beach. Kids loved the pool. My thanks to Sophie for being so helpful and responsive during the booking process and answering all our stupid questions such as does the house have a hair dryer (yes was the answer btw). Thanks James for the kind words. We work hard to make everyone's stay comfortable and for the house to have everything you need. Yes for the record we have towels, hair dryers, cooking utensils, a baby high chair, a cot, and we provide initial supplies of soap, shampoo, toilet paper and a dishwasher tablet. Thanks for the kind words James, many thanks. * 30 minutes drive to Orlando International Airport and1 hour from Sanford. * Beaches - about 90 mins. Rates are subject to change until booked. We do require a $300 refundable security deposit. Full payment is required 2 months prior to booking. Pool heating is an optional extra at $30 a night (minimum 5 nights). If part week is required then there is a call out fee to switch on of $50 We also need you to complete a booking form which we must have completed before we can release the villa details, Please pay the amounts due promptly. We operate a first come first served policy, so if another customer pays the booking deposit first they will secure the booking, even if you have been talking to us for weeks. Once the booking deposit is paid the booking is confirmed.